With the seasons changing I tend to find my winter foundations starting to look a bit too much for brighter days, I have recently been trying out this Laura Geller Baked Liquid Radiance Foundation in Fair, it does come in 9 shades so I am sure you would find one to suit, I would say this is a mid price range at £28.00 for 30ml it's definitely not overpriced for what I would consider a higher end product. Being a water based foundation it feels really light and moisturising, it gives a definite glow to your skin without looking even slightly greasy. It also contains colour correcting pigments that give you an even flawless finish, I have to say that with my skin being mature I absolutely loved this, it didn't float into lines and really did give a dewy light/medium coverage finish, which surprised me as I tend to go for full cover, it was one of the easiest foundations I have ever tried for blendability, no streaks, patches or neck line, it was almost like applying a face cream but with a great end result. In it's glass bottle with marbled lid the pump dispenser gives you the perfect amount with one squirt, I have tested this out on lasting power, and it held up really well, I constantly touch my face so any foundation that can cope with me is pretty good stuff. 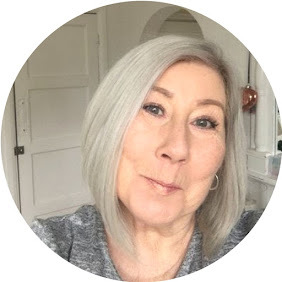 I have heard it said That Laura Geller is a brand for more mature women, while I strongly disagree with this as I think it is suitable for any age, this foundation is perfect for us "older" ladies. I may have to try this foundation, I have been looking to change from my current one. I have tried Laura Geller's Pucker Up Lipstick in the past from b-glowing and love them. Hi SandyMay, thanks for stopping by, I am a huge fan of Laura Geller, I hope this foundation works out for you.